The palm branches brought in by our pastor for this Palm Sunday were augmented by large fan-shaped branches gleaned from the nearby woods here in Tokyo, and carried in by eager middle schoolers to create a very green and festive opening hymn processional. As the parade of Sunday School students ended, many of the large branches were placed on the floor at the front of the church where the children typically gather for the kids’ sermon. It made an inviting carpet and the children who came forward to hear the message were thrilled with the opportunity to stretch out on a mat of live greenery. Some even lay down to press their cheeks against the cool, green smoothness of the leaves. It was a perfect listening environment for a Palm Sunday message. After the service, the children were encouraged to carry their branches home to remind them that it is now Holy Week. Everyone seemed to want to carry a branch, even our dog, who sometimes waits for us in the courtyard during the service. 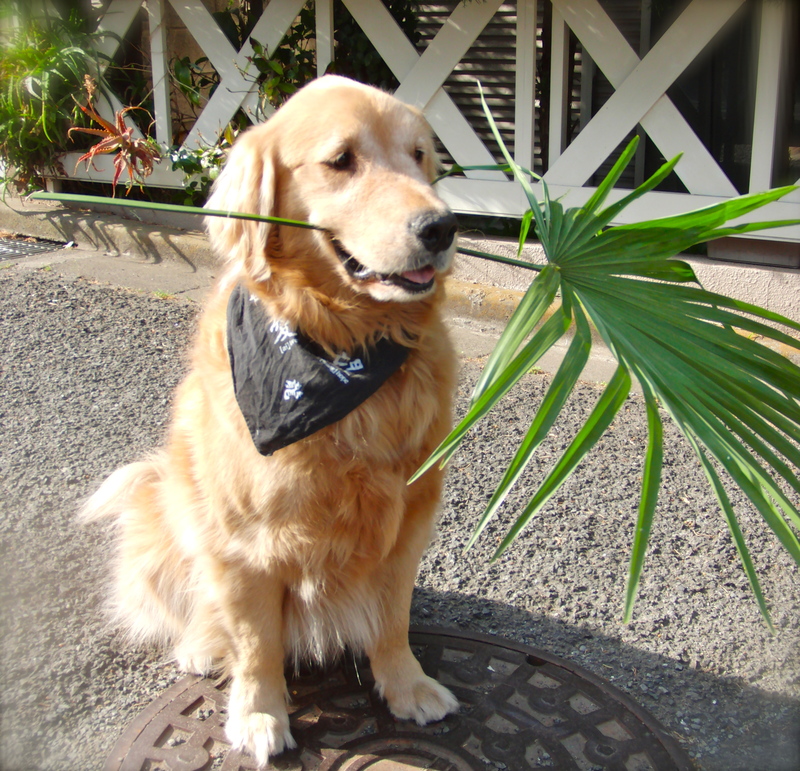 Seeing a branch waving temptingly close to his snout, Bjorn, the ever-eager Golden Retriever, snatched up a palm frond and trotted about, proudly with both tail and palm waving triumphantly in the air. Let all creatures praise the Lord! Preparation: Bring a large palm branch to signal the shouts of “Hosanna!” If possible, bring palm leaves to hand out to the children. Today is Palm Sunday! Do you know what happened on Palm Sunday? There was a parade. How many of you have been to a parade? They’re exciting to watch, aren’t they? There are lots of people lining the streets, waiting to see the action. There’s lots of noise; marching bands and horns; people yelling, laughing, and dancing; clowns throwing candy and kids running around. It’s bright, colorful, and noisy. I like parades. I want you to imagine that you’re all sitting by the side of a dusty road, waiting for a parade to start. You got up early to get a good seat and you’re waiting. You wait for a long time, but you don’t hear anything. Finally you hear voices, shouting, singing, laughing. You see dust rising at the end of the road. He came riding on a young donkey. Have you ever seen a parade that consisted solely of one man riding on a donkey? It may not sound that exciting, but this was King Jesus, the man who could do miracles and heal people. The crowd knew who he was, and they went wild! They yelled, waved palm branches, and threw their coats on the road! Did they make a lot of noise? They sure did! The whole city heard them! Everyone came running. We’re going to hand out these palm leaves for you to wave, and I’d like everyone on this side to yell, “Hosanna!” and everyone over here to yell, “Blessed are you, King Jesus!” When I raise this big palm branch, you can start yelling. If I raise it really high, you can yell really loud. When I lower the branch down, stop yelling, okay? Let’s see what Palm Sunday might have sounded like! (Raise palm branch and encourage everyone, including grown-ups, to join in.) Hosanna to the Lord! Hosanna in the highest! Wonderful children’s message and great photo of Bjorn, the Palm waving dog! He was always so enthusiastic about going to church and seeing people there! Love the story. Miss you.